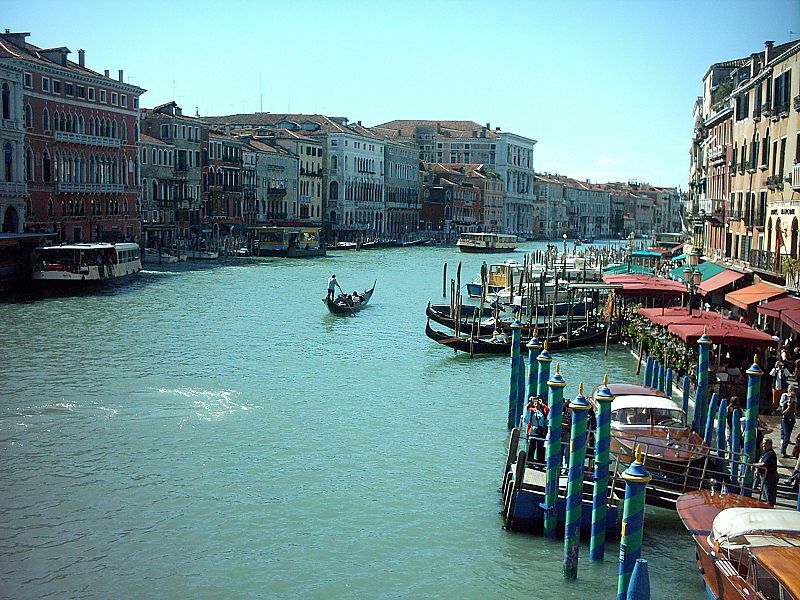 I have a trip coming up, to Venice, and I’ve never been there. I’m doing a lot of research and I’ve written an article about women’s travel wear. I’m still a bit of a wreck from surgery, but I get better and better each day. Read my article, The Best Sites for Women’s Travel Wear. We just got back from a weekend cruise to Vic and Van. It was swell. I want to go back soon. 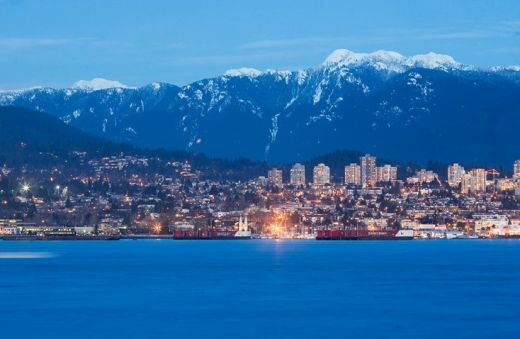 We didn’t have enough time in Vancouver! Ray was almost eaten by a giant Troll. 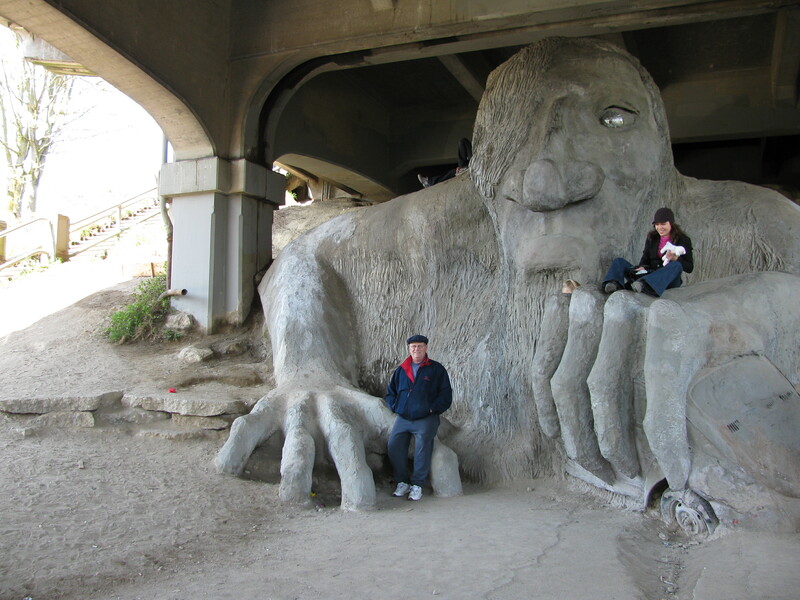 Fortunately the Fremont Troll did not find friend to be delicious. Troll spit him back out. We had a good Cheap Date at Ivar’s and Gas Works Park. 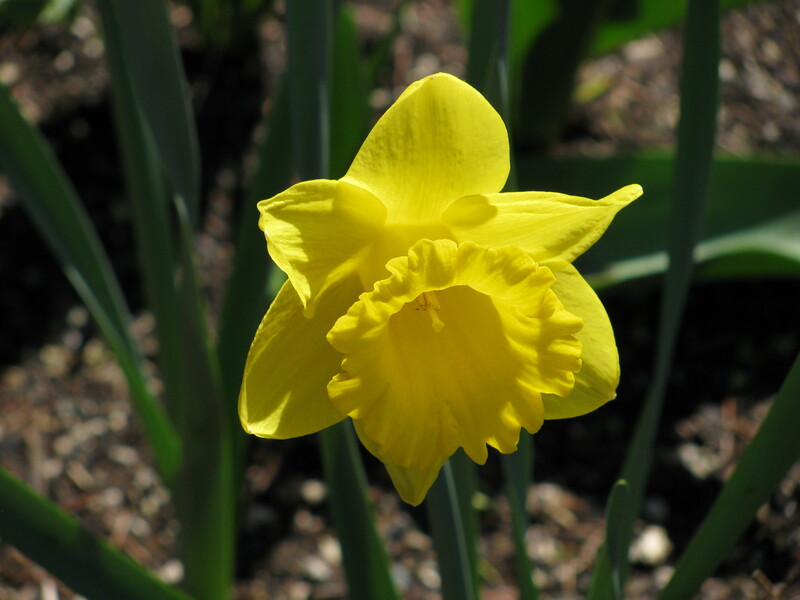 It’s spring. Here is the proof! Go to Ivar’s on Lake Union. Yum. Read about Cheap Dates in Seattle. I have so much more to say, so I’ll have to write another Cheap Dates. When you go on vacation, you want to get up and out of the hotel as quickly as possible. You want to see the Vatican Museum. You want to see the Great Wall. You want to see The Queen of England! Well, if you weren’t born with wash n wear hair: Wear a flipping travel hat to get the most out of your vacation! I am in Seattle, sitting at my computer, cold. And, then I see this old picture of me (pink hat) and two pals. It reminds me that somewhere in time, I am smiling and warm and happy-go-lucky or holly-go-lightly or …. ok, I’ll stop rambling. 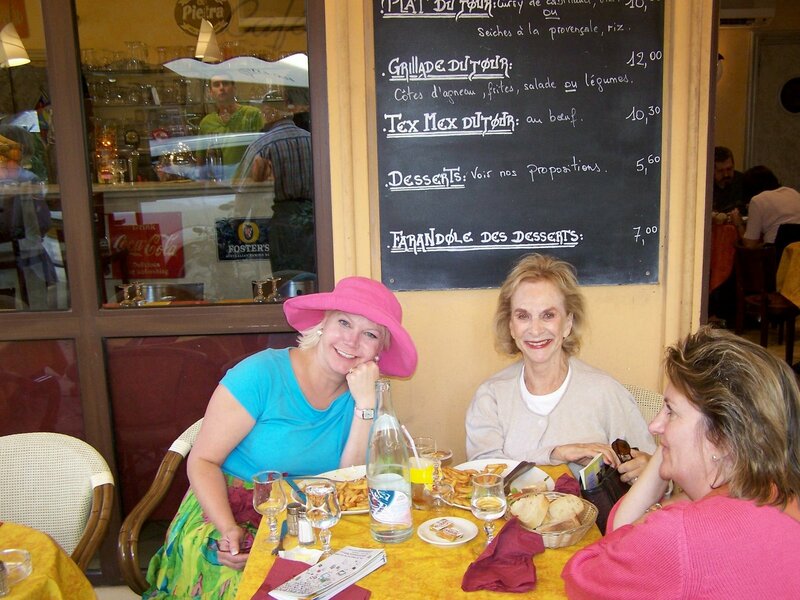 We were having lunch in Aix-en-Provence. (About 4 years ago.) I was eating a croque-monsieur sandwich because I knew what it was. I always ordered the same few things. Next time I will branch out into eating a croque-madame. Anyway, this photo makes me happy. It reminds me of Paul Simon’s song “KODACHROME”. Funny this. You can’t imagine how much I worship this free view and this free museum….and My Darling Clementine. “Pink’s Hot Dogs” at Melrose and La Brea. Yum. I like Pink’s better than the dogs in NYC. 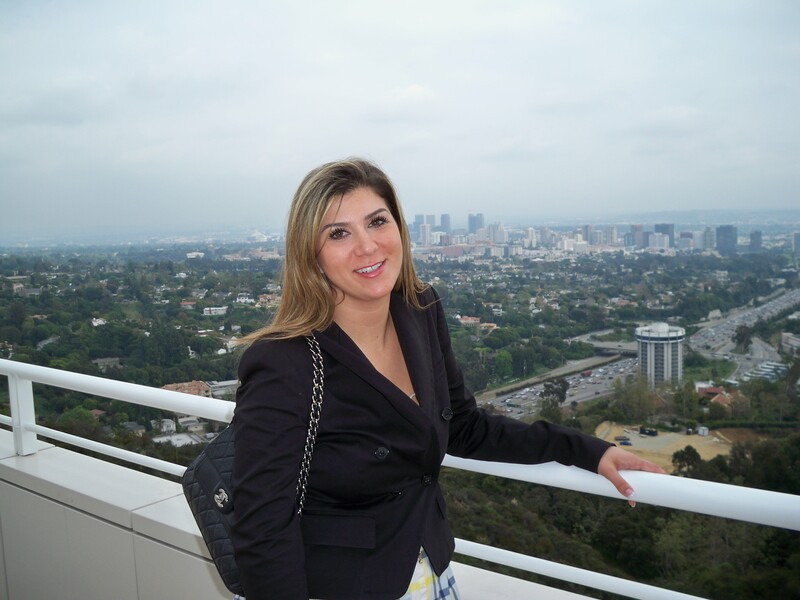 Happiness in Los Angeles resides in a Getty Museum. I hope to see the other Getty Spectacular tomorrow if our day fits the plan. The Degas pastel (above) was one of my daughter’s favorite pieces. Good taste, for sure. Tomorrow we will probably see the Getty Villa or go to the beach or create something California Cool in happy-go-lucky beatnik flip-flops….and hopefully, we will find a way to fit in some tasty Pink’s hotdogs! 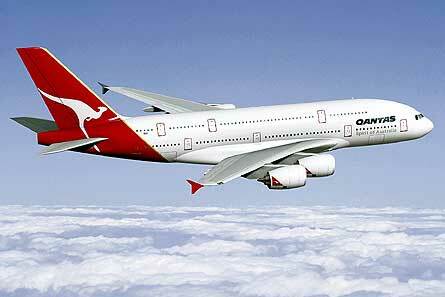 Qantas All the Way to LAX Baby! Ray and I are extremely and superbly tired. We had a 27 & 1/2 hour journey from Pepper’s Beach Club (hotel) in Port Douglas, Queensland, Australia to the front door of our house in Seattle. We went from the mid-nineties and 75+% humidity (Australia) to a nippy Western Washington low 30’s and clear, cold skies. And, instead of white sand we had white snow. Now that I have good access to a computer, I will toggle and juggle the travel info in my head and try to give you a better idea of the different aspects of our trip. Right now, it’s time to sleep. I did not think I would like New Zealand and Australia. I came on this vacation because my husband MADE me go with him. I DON’T WANT TO LEAVE the Kangaroos. I DON’T WANT TO LEAVE the warm beaches in Australia. I DON’T WANT TO LEAVE the beautiful Sydney Harbour. I DON’T WANT TO LEAVE Melbourne. I DON’T WANT TO LEAVE New Zealand. Down Under is the greatest place in the world. The people are “right there” how you want them to be: honest. It’s not too crowded. I might move to Australia if I can find a way to do it. I want to go back to Australia. 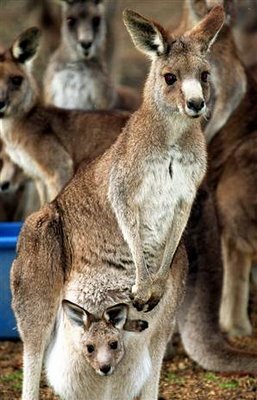 I want to see the kangaroos, the koalas, the dolphins, and even the Tasmanian Devils. I love Seattle, but I might love Sydney even more. If my kids didn’t live in The States, I’d be packing and moving Down Under.